MP4 To MP3 Converter is a windows utility that quickly converts MP4 to MP3 audio format. The converter also supports AVI, MPG, FLV, WMV, MOV and more video formats to MP3, WMA, WAV, OGG, FLAC audio formats conversion. It supports batch mode also. MP4 To MP3 Converter is a windows utility that quickly converts MP4 to MP3 audio format. 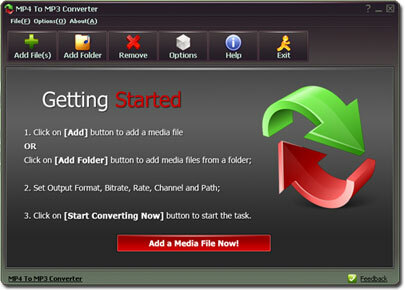 The converter also supports AVI, MPG, FLV, WMV, MOV and more video formats to MP3, WMA, WAV, OGG, FLAC audio formats conversion. There are many online and free YouTube downloaders on the web, so users can download their favorite music videos from YouTube as MP4/MPEG4 format. 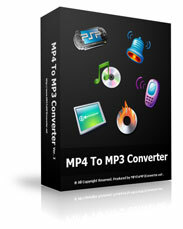 With this converter, they are able to convert MP4 videos to MP3 music for portable devices. Besides MP4 format, the Converter also supports several popular video formats like MPEG, MOV, WMV or AVI etc. It can extract MP3 from video formats. WAVE is a lossless audio format but WAV files are big. People can encode WAV to MP3 format and set a better bitrate for conversion immediately with the program. Converting MP4 to MP3 is not enough for users. With Cut Feature (in Settings), users can cut audio files to a piece of MP3. That means they can make ringtones from MP4 videos. MP4 to MP3 Converter is one which helps in converting the audio files from a particular format like the MP4, AVI, MOV, and WMV to MP3 or other formats. There are many advantages offered by this software as there is a large content of data available in various formats which you wish to enjoy.All these content from various other formats can be converted to the standard MP3 format which is supported by all media players. The technicalities of the audio formats could be difficult to understand to a common man. But, the converter makes the process simple. A three step procedure is enough to convert an audio file of any format to a standard MP3 format which can be used in any of your media players. The MP4 to MP3 software is designed to work faster than any audio conversion software. It is designed to support a wide variety of audio and video formats which are available in the market. The files need not only be converted to MP3 but also to other good quality formats like WMA and FLAC. Batch mode conversion is available in this software which is very useful for large data. The audio files which are available on the internet might not be of good quality. Good quality audio files would have a bit rate of 320KBPS, whereas most of the files available on the internet are around 180-270KBPS. Using the software the quality of an audio file can be improved. In the software during the conversion process, the output path can be set to 320KBPS which would thus improve the bit rate of the audio file. A unique feature offered by the program is the feature of video extraction. On the World Wide Web there are many videos shared. These videos can be downloaded from the internet. If you wish to enjoy just the audio of the video, this software offers the utlitiy to extract the audio off the video and convert it to the standard MP3 format. The software also helps in Encoding MP3 from WAV format. The converter offers the option of cropping the MP3 audio files. For example, if you need a particular part of the audio file for a performance, it can easily be done using this software. The procedure involved in cropping the audio file is simple. It is to be noted that the original file would remain even after cropping the MP3 file.